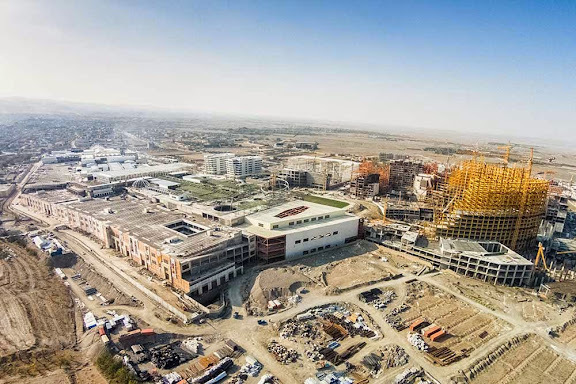 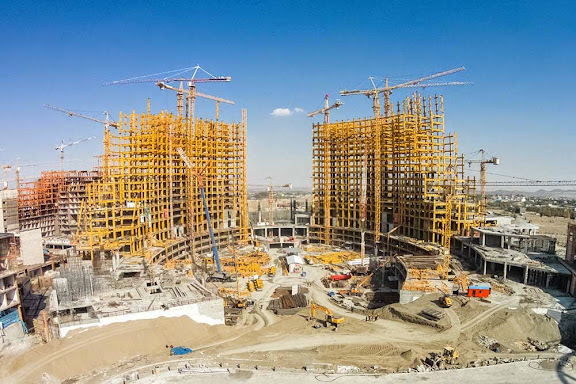 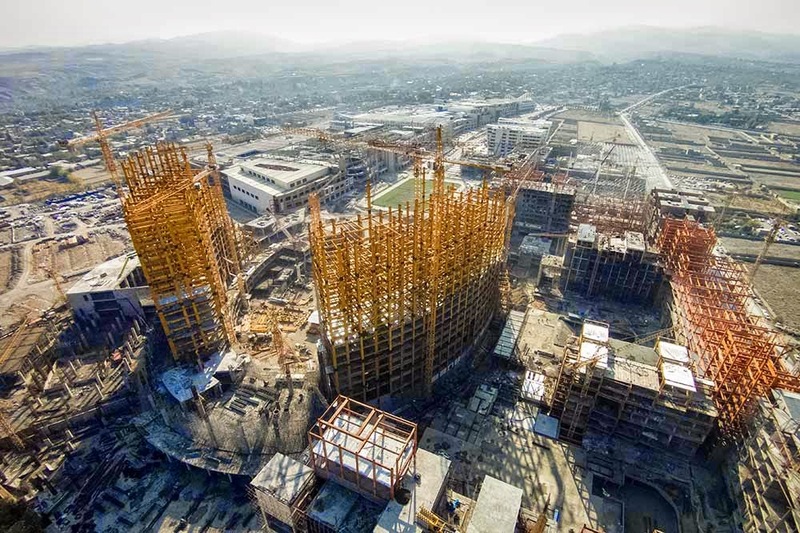 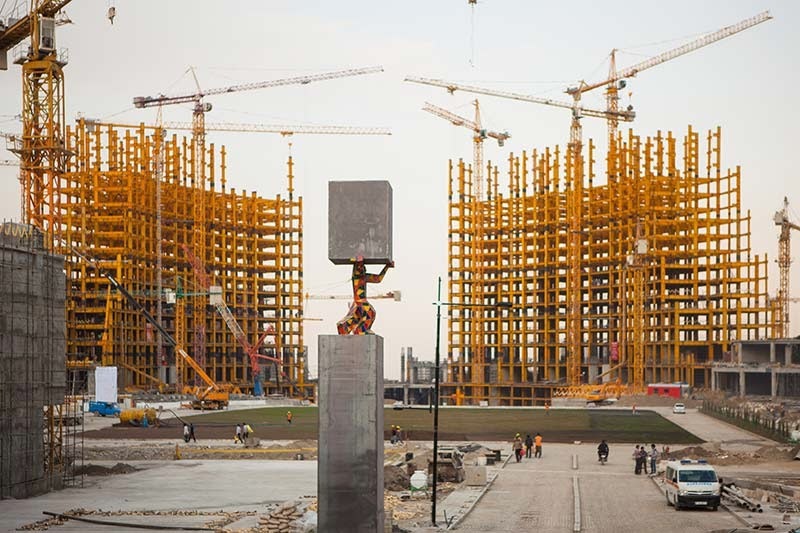 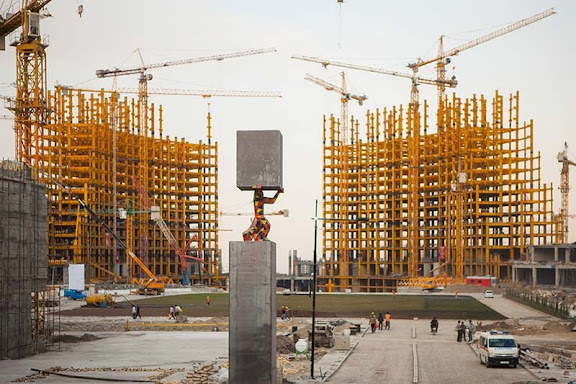 Considerable progress detected at the massive construction site for "Dreamland of Padideh Shandiz" in Mashhad. 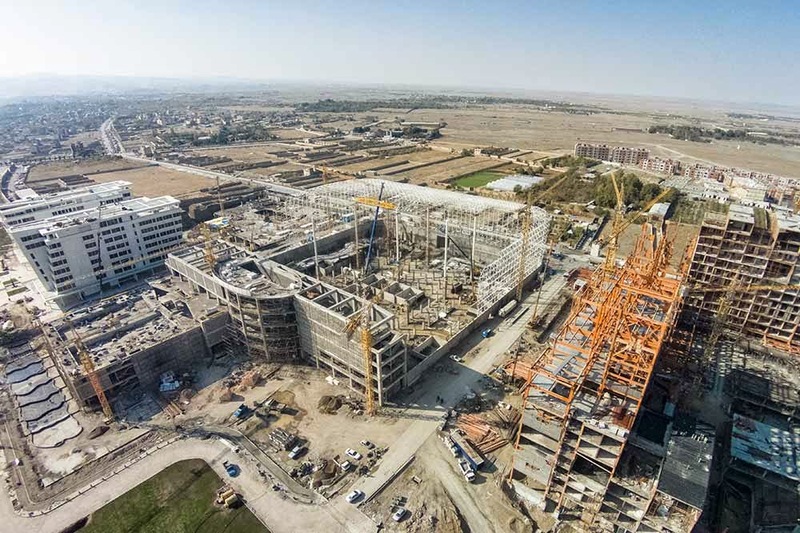 To put this construction activity into perspective, UOI report from 14JAN14 click HERE, from 18AUG13 click HERE. 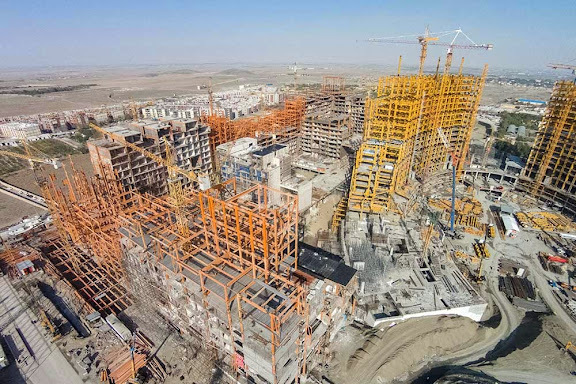 Readily apparent in these images there is no slowdown in effect for this development. 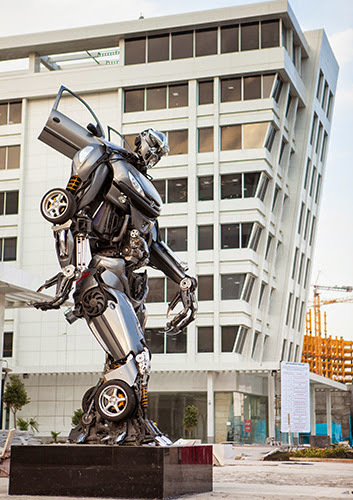 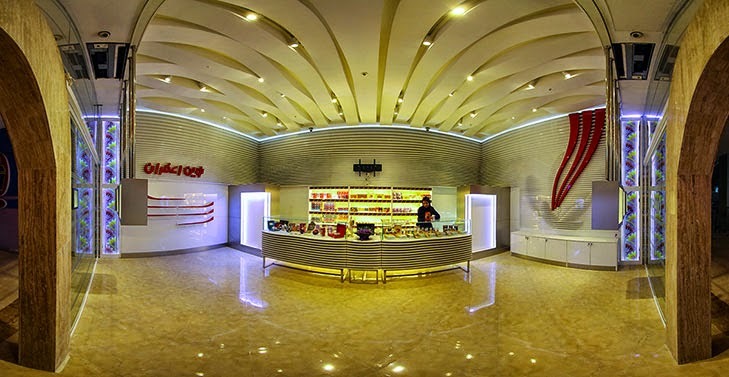 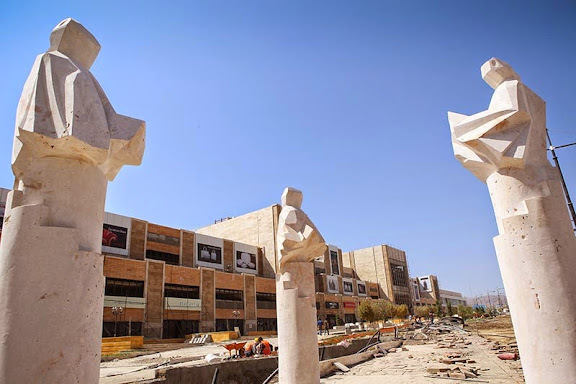 This is a multipart post, with parts below related to construction, outdoor artworks and retail stores interiors. Hotel in yellow steel fame, rising vertically with the assistance of at least six tower cranes. Click HERE to gauge the level of progress as seen last December 2013. 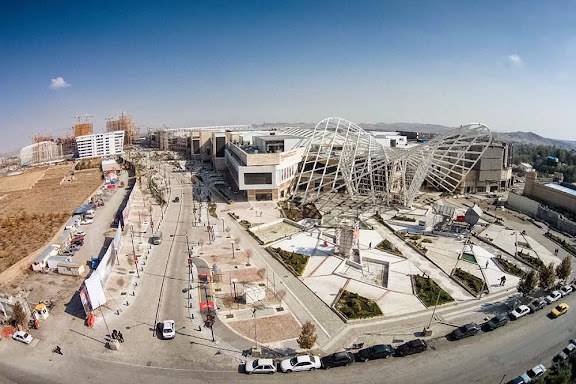 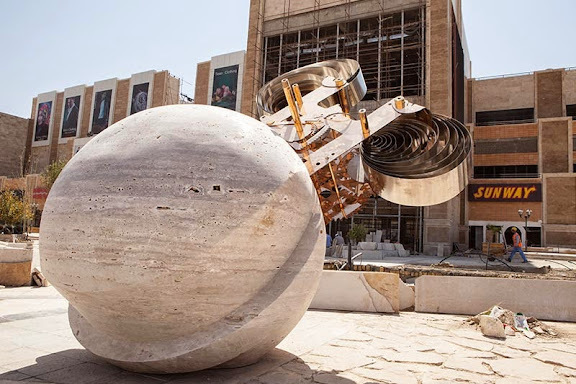 View of the giant outdoor LED and sculpture adorning the shopping mall section of "Dreamland of Padideh Shandiz"
Interior view of indoor amusement park section, under construction. Note two large LED displays. 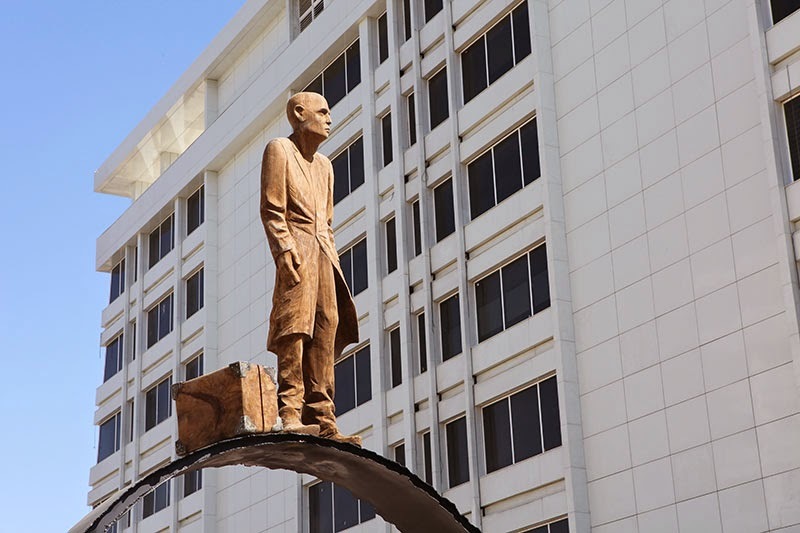 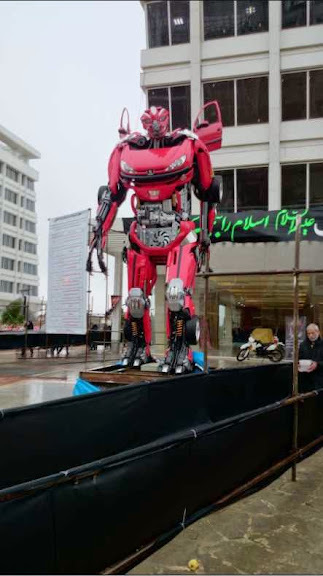 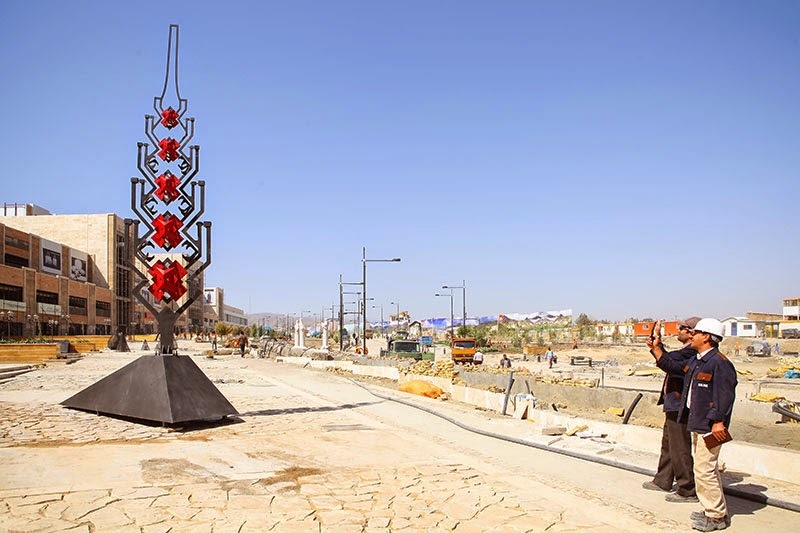 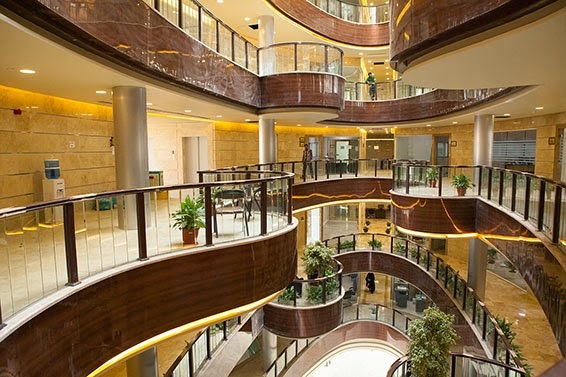 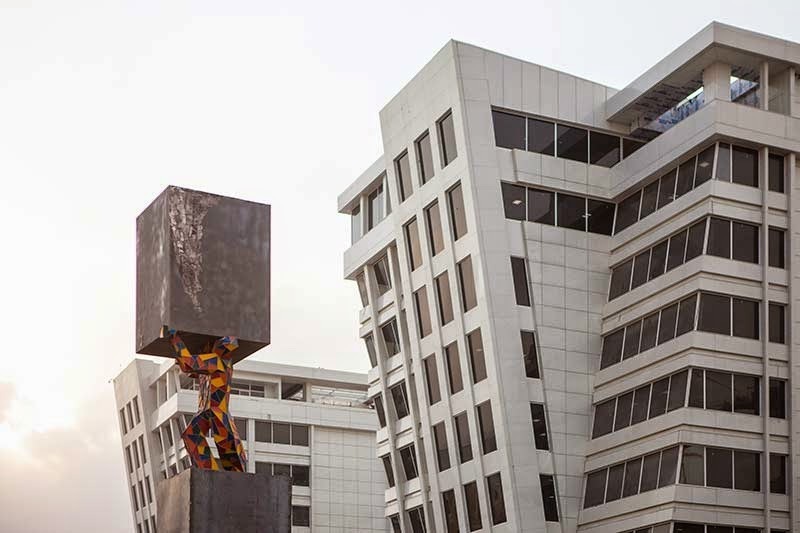 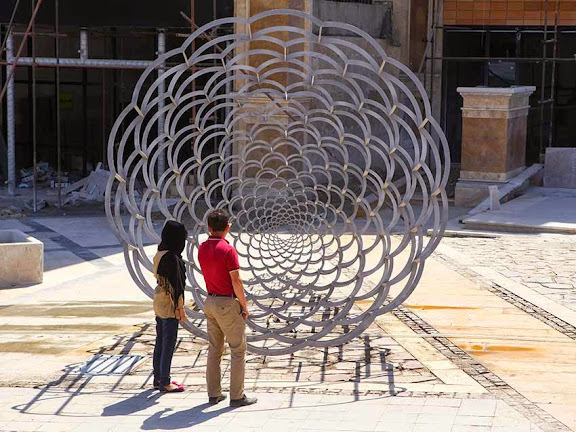 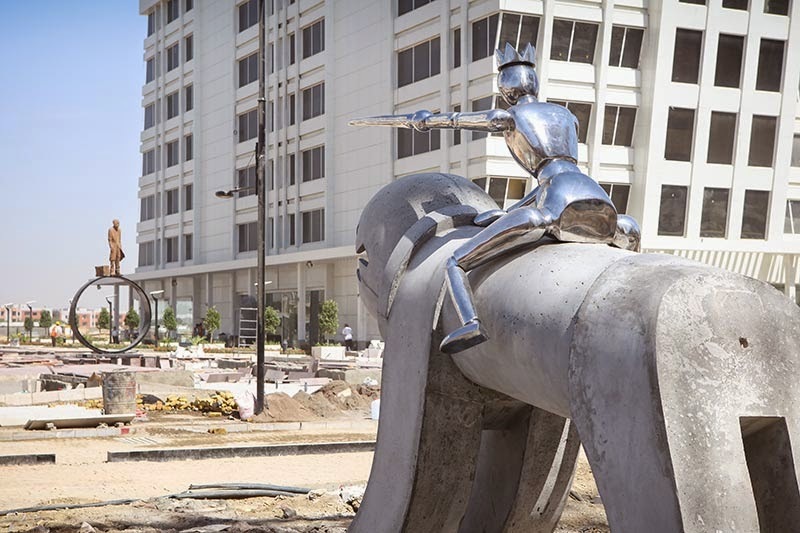 Numerous pieces of sculpture by local artists have been situated within the "Dreamland of Padideh Shandiz" site in Mashhad. See below for additional examples. 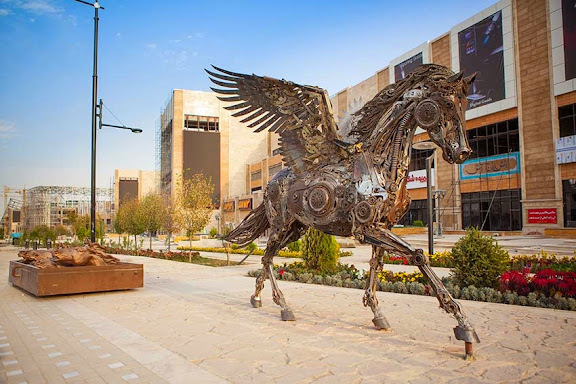 Detail of "Man hoisting block" situated near largely mixed-use section of "Dreamland of Padideh Shandiz"
Detail of "Man with suitcase" situated near largely mixed-use section of "Dreamland of Padideh Shandiz"
Detail of "Pegasus in steel" sculpture, near shopping mall section of "Dreamland of Padideh Shandiz"
Concrete and steel spring sculpture, near shopping mall section of "Dreamland of Padideh Shandiz"
Modern art sculpture situated near mixed-use section of "Dreamland of Padideh Shandiz"
Anthropomorphic pillars sculpture near shopping mall section of "Dreamland of Padideh Shandiz"
Steel sculpture situated at walkway near shopping mall section of "Dreamland of Padideh Shandiz"
Sculpture situated near shopping mall section of "Dreamland of Padideh Shandiz"
"Transformer" sculpture in steel, situated near mixed-use section of "Dreamland of Padideh Shandiz"
Another "Transformer" sculpture situated near mixed-use section of "Dreamland of Padideh Shandiz"
Interior detail of a functioning retail clothing store within shopping mall section of "Dreamland of Padideh Shandiz"
Interior detail of a lounge within shopping mall section of "Dreamland of Padideh Shandiz"
Interior detail possibly within mixed-use commercial section of "Dreamland of Padideh Shandiz"
I have to believe from the false dilemma piece recently penned by Ray Tayekh for the Washington Post, he has no idea this level of development is possible in a heavily sanctioned Iran.